Inuyasha: It’s great to be back home, darling. Karan: Hakkaku! You have returned! Hakkaku: I surely did, honey! Shunran: Oh, my beloved, sweet, Ginta! Ginta: My lovely Shunran. Your kisses make me filled with such pleasure and joy. Ayame: So, how was your great battle with the lion Onis? Shunran: I gather that you managed to show them who was the boss with those bulging muscles of yours? Inuyasha: Yeah. We tackled those beasts with our own strength. I got my claws and fists to finish him off. Hakkaku and Ginta: And we pinned them down! Inuyasha: You could say that they were no match for us. Right, guys? Hakkaku and Ginta: Right, Inuyasha. Ayame, Karan, and Shunran: Wow, impressive! Hakkaku: And since you ladies missed us so much. Ginta: We have something for you. Inuyasha: I know you can’t resist this, Ayame. 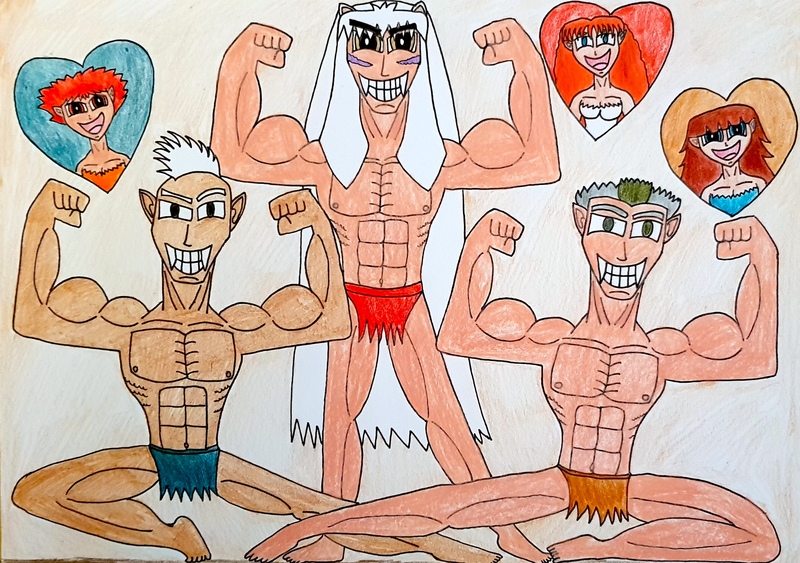 Ayame: You managed to put those awesome muscles of yours to work, my most beloved Inuyasha. Hakkaku: Karan, babe, check this out. Karan: You continue to cut such an impressive figure, Hakkaku, you stud of a man. Hakkaku: My muscles thank you so much, my beautiful Karan. Ginta: I hope you’re ready for this, my sweet Shunran. Shunran (blushing and giggling) : Of course, I am, my hunky, funny Ginta. Shunran: Wow! I love it when you put your muscles to work. Inuyasha: Well, that’s all the time we had, ladies. Hakkaku: How about we take up where we left off? Ginta: And you can see a lot more of us. Karan: I think I would love that, Hakkaku. Shunran: It would be my pleasure, Ginta. This piece of Inuyasha x Ayame or InuAya, Hakkaku x Karan or HakkKar, and Ginta x Shunran or GinShun fan art is dedicated to sahori yamilet aka kokorotenshii, Tenshi-Yoru, Sarah aka frauleinpflaume, Balaszy Geza aka balgeza, Fraise aka FraiseParfait, CandiiDrawing, Sam aka sambeawesome, and SylunisArt who celebrated their birthdays several days ago. So, I hope you had such blessed, awesome, and phenomenal birthdays and I wish you a lot of love, joy, happiness, and prosperity in your lives as artists and as people. Como se dice en español, yo espero que hayaís tenido cumpleaños benditos, maravillosos y fenomenales y os deseo mucho amor, alegría, felicidad y prosperidad en vuestras vidas como artistas y personas. Come se dice in italiano, spero che voi tutti abbiate compleanni benedetti, maestosi e fenomenali e vi auguro molto amor, gioia, felicitá e prosperitá nelle vostre vite come artisti e persone. Wie man auf deutsch sagt, ich hoffe ihr hattet gesegnete, tolle und phänomenale Geburtstage und ich wünsche euch viel Liebe, Freude, Glück und Wohlstand in euren Leben als Künstler und Menschen. This is also dedicated to all of the fabulous InuAya, HakkKar, and GinShun shippers out there. So, sit back, relax, enjoy and soak in that InuAya hotness and goodness, that HakkKar adorability and awesomeness, and that GinShun sweetness and loveliness. What would happen if you combine pale silver-haired, handsome, strong, buff warrior hunks with fiery, gorgeous, feisty red-headed goddesses? You get three of my most beloved Inuyasha OTPs of all time, Inuyasha x Ayame aka InuAya, Hakkaku x Karan aka HakkKar, and Ginta x Shunran aka GinShun. 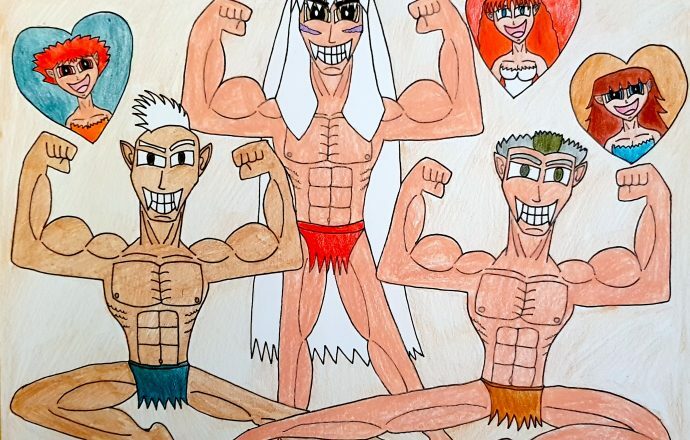 Ayame, Karan, and Shunran are surely lucky to have such strong, handsome, brave, and muscular husbands like Inuyasha, Hakkaku, and Ginta flexing their well-toned, wonderfully-sculpted muscles for them. They can never have enough of their husbands and they love them to bits. I bet you all know where this is going to go after this. I hope you all enjoyed this and I will see you in the next submission. Take care. Cuídaos. Vi riguardi. Mach’s gut. Inyuasha, Hakkaku, Ginta, Ayame, Karan, and Shunran from Inuyasha belong to Rumiko Takahashi and Sunrise.